We are taking the kids to Cooksville, Tn to see some of the great waterfalls in the area. We will be traveling from Elkhart, In (way up top) to Tennessee via 65. This trip will be 8/10-13. A very quick trip. Open to any suggestions for good meals along the way. We will probably stay around Jeffersonville, In or Louisville, Kentucky Friday night and drive the rest of the way Saturday. After exploring the waterfalls for a day or so we will be going Nashville to do some sightseeing and shopping if my 14 yr old daughter has anything to say about it. I can tell you that my family would NOT be interested in hot chicken . I went to Nashville for the first time a few years ago and loved both the Loveless Cafe and Arnold's Country Kitchen. I know both places are maybe a little touristy, especially the Loveless, but they both lived up to their reputation in terms of the quality of the food. Arnold's was being expanded when we were there, so it may be a little easier to get a table now. A non-food note: if you're into history, Lincoln's birthplace is not that far off 65 a little ways south of Louisville. I enjoyed it very much. From there, we went to the Whistle Stop in Glendale, KY, which serves various Kentucky specialties (country ham, hot brown sandwich, etc.). I'll 2nd the Loveless Cafe! The food is great, especially the biscuits and their Country Fried Steak. Well worth the trip and inevitable wait, to eat there! I can sympathize with your family not wanting to stop for hot chicken. We will be in Nashville at the end of the big trip and I'm glad I got my hot chicken fix when I visited Nashville last year, solo, because I know there won't be any this year since Sandra will be with me. I've never been, but I have friends who love the Loveless. They sent us pictures of the biscuits on their last visit a couple of weeks ago. Hello Rocky! We will be in the same area next weekend. We land at Nashville on Friday night the 10th, leaving the next morning past Cookeville and spending the day in Knoxville. We will be driving back to Nashville the next morning, hopefully leaving time to hit a few favorites before we fly out Sunday night. Not sure how these schedules match up, but we would love to grab a meal with you if we are in the same town at the same time. Rocky, I'm guessing you've already been to Joe Huber's but on the off chance you haven't, it's not that far west of I-65. And if you wind up staying on the east side of Louisville there's Claudia Sanders Dinner House as well. I have never even heard of Joe Huber's. Quite honestly I hardly ever go to southern Indiana unless it is for a meeting or traveling through. The one exception is fairly regular trips to mecca (that is Assembly Hall on the campus of Indiana University for the uneducated). Will have to try to visit Joe Huber's on the way back through because there is no way the kids will wait that long to eat dinner on Friday night. We can't leave Elkhart until 5pm due to football and band practice for Ian & Amelia. You have never led me wrong in the past so I will make a concerted effort to hit this place! It would be wonderful to break bread with you again. I sent a PM. On our drive from Nashville to Knoxville, we plan on stopping at Ralph's Donut Shop in Cookeville. We have never been there, but the photos and reviews look great. Well now we have a must stop in Cookeville. Thanks for the info! Sorry for the delay but I am just now getting a chance to talk about our trip to Nashville/Cookeville. With the exception of a couple of highlights it was disappointing in the food category. Disappointment #1 was we didn't go as far as I wanted to make it far before my kids were saying they wanted dinner. I had an old friend that raved about a restaurant he came across called the Lakeside Kitchen in Nyona Lake, In. I have lived in Indiana virtually my entire life and other then seeing a directional sign Nyona Lake on hundreds of trips down US31 I never even knew it existed. Since we were a long way away from anywhere we decided to give it a try. Everything was standard, prepackaged frozen food. The hush puppies that the kids had with their meal was not even cooked all the way through. The highlight of the meal was the Karaoke going on in the other part of the building. It was entertaining in an off-key, screechy sort of way. The staff were friendly and helpful. We ended up spending the night in Columbus, In and there were no local restaurants to be seen so we had breakfast at a Bob Evan's. We drove to Cummins Falls State Park. It is an incredible place to visit, we had a blast! If you go be prepared for a arduous one mile hike down a dirt trail and over a very slick river bed but the payoff at the end is worth it. That night we tried Stroud's BBQ, a small regional chain. I should have known there was a problem when we got out of the car and there was no aroma of smoke. I ordered a rib meal with mac & cheese and cole slaw. I also order a quarter LB of pulled chicken and a quarter LB of ham. My wife and son both got the pulled pork meals. The meat appeared and tasted as if it had been prepared earlier in the day and had been waiting in warming trays for 8 hours. The ribs had no juices whatsoever, the chicken was pretty good but dry without the sauce and the ham was cold. I don't mean a little cold, I mean straight out of the refrigerator cold! The M&C was very bland, my wife stated that she thought it might have been Stauffer's. The highlights of the meal were the cole slaw and their BBQ sauce. The slaw was vinegar based and excellent. The cabbage was crisp and tasted very fresh, some of the best slaw I have ever had. The sauce was outstanding. It hit all the right notes and I think it would've made my flip flops taste good. The next day we tried to go to Ralph's Donuts in Cookeville. Earlier in the thread you may have seen a reference to them by Buffetbuster. I had done some research and they are listed in one article as one of the 25 best donuts in America. I got the kids all excited about trying it out only to find out it is closed on Sundays. I assured the kids we would try them on Monday but alas we were TTMed as they are also not open on Mondays. So it was the free hotel breakfast and off to Nashville for sightseeing and fun. The absolute culinary highlight was The Loveless Café where we had an outstanding meal. The food was excellent but the company we had was even better. We were able to meet up with Cliff and Mariton. It is pretty rare that my whole family raves about the food at a restaurant but this time they did. We all tried different things. 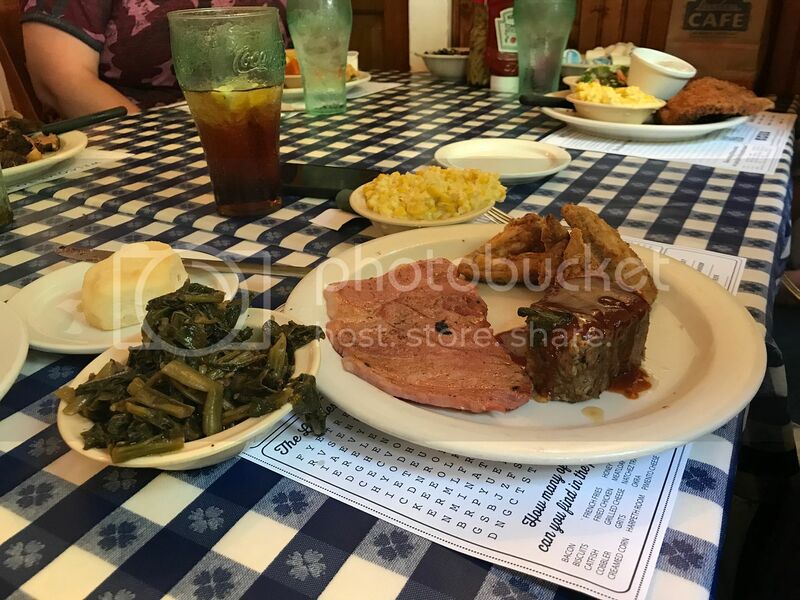 I had the sampler platter with meatloaf, country ham and fried chicken with sides of collard greens and the best creamed corn I have ever had. The chicken was the star of that dish! Kathy had the catfish and enjoyed it immensely. Amelia had her normal, chicken strips, but they are now the gold standard that all other chicken strips will be judged by. Huge with a great crunch and juicy...she loved them. Ian had one of the specials, brisket, and really liked it. I had little pieces of all their entrees and was thoroughly impressed. Cliff had the country ham dinner and was very surprised when it was accompanied by two perfectly cooked eggs. Mariton has the friend pork chops. The conversation was the best part with my family having the opportunity of getting to know, a Roadfood legend, Buffetbuster and his lovely wife Mariton. It will be a meal they will remember for a long time. That evening we went to a little gem of an ice cream shop in Cookeville. I saw a drawing of it behind the desk at the hotel in Cookeville and was assured that it was a local place and a bit of an institution. Located on Broad St in downtown Cookeville (right across from the rail station). It has been there since at least 1950. Great neon, I took a picture and sent it to Cliff, and very quaint. The ice cream is stupendous and they have 30 flavors. I had a dish of the salted caramel and the loaded butterscotch. The ice cream was rich and creamy with great flavors and a smooth mouth feel. 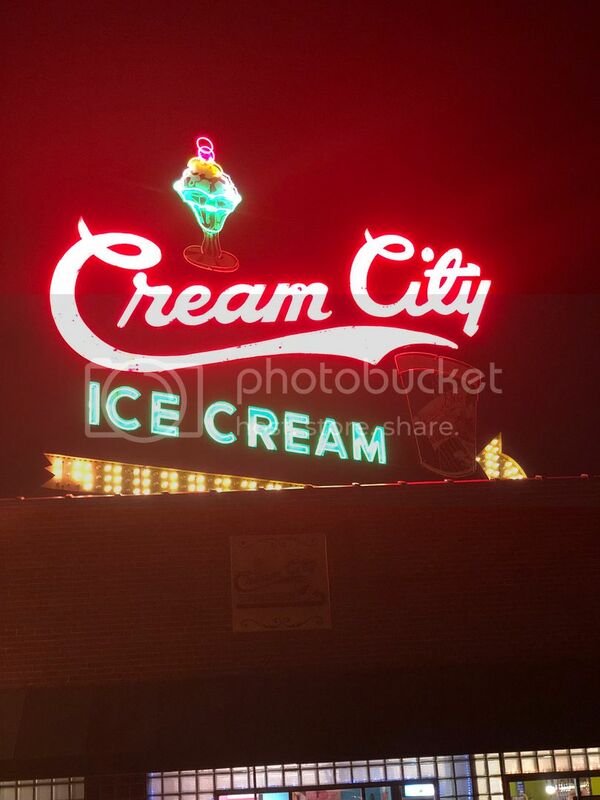 We all LOVED Cream City and would make a detour there anytime we are in the vicinity. Highly Recommended! Thanks for all your advice and one day I would like to stop at some of the other restaurants you all recommended. I'll bet your kids will be talking about this trip forever. Especially the disappointments that Dad dragged them to. As I had previously mentioned in this thread, it was a great pleasure to see Rocky again and this time meet his wonderful family. I hope we see them again in Indiana soon.